On Thursday, May 18, Brandon Hudgins will be accepting the NORD 2017 Rare Impact Award. 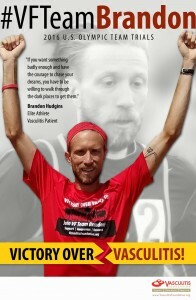 The VF nominated Brandon, a record-breaking, elite runner, for his work raising awareness about vasculitis, and the Vasculitis Foundation. Hudgins was diagnosed with GPA Wegener’s Vasculitis in 2008. Despite the illness, he became one of only 449 Americans to race a mile in under four minutes and earned a spot in the 2016 Olympic Trials. In April of 2016, Hudgins joined the VF on a new campaign called, Victory Over Vasculitis: VF Team Brandon. As the leader of this virtual team with members throughout the world, Hudgins challenged vasculitis patients to define their own personal victory over vasculitis, and set out to accomplish it. The Rare Impact Awards serves as NORD’s signature fundraising event in which it brings together the entire rare disease community to celebrate people and organizations who are making extraordinary contributions to help others. This event also serves as an opportunity to individually and collectively renew our commitment, energy, and focus to provide critical services to help the 30 million Americans with rare diseases. The Rare Impact Awards will be live-streamed beginning at 7:30 p.m. Click here to watch the ceremony. Brandon will accept his award at approximately 8:45 p.m., ET.